As controversy continues to surround the manipulated events at the recent fourth Test between England and Pakistan – events orchestrated and paid for by the News of the World to demonstrate corruptibility – and as the New York Times investigates allegations of illegal phone hacking at the NotW – the News of the World’s story-gathering will also come under scrutiny next week in relation to another matter, the match-fixing allegations the paper published in May about the world No1 snooker player, John Higgins, and his business partner, Pat Mooney. Higgins and Mooney face charges relating to alleged agreement to frame-fixing at future events that the NotW reporters were pretending they would stage. A tribunal hearing is scheduled to take place next Tuesday and Wednesday, 7 and 8 September, at an undisclosed location, probably in central London and definitely behind closed doors. If found guilty then Higgins and Mooney will be punished, under snooker’s sporting laws at least, as no criminal activity has been alleged, let alone proved. The case is important for the accused for obvious reasons, but also important for the newspaper and its credibility, and for snooker’s governing body, the WPBSA, which suspended Higgins in May before any investigation on a “guilty until proven innocent” basis because of the severity of the accusations. Investigations by this website over a period of several months have highlighted some discrepancies in the presentation of evidence gathered by the News of the World, and reality. Some subtitles in an apparently damning video are wrong. A phrase that a general viewer would believe to be attributed to Higgins, saying ‘Yeah, simple as that’ in relation to missing a ball, was not said by him. (Watch the segment of video, where his lips don’t sync, between 40 and 50 seconds into the video). Sportingintelligence has also detailed other anomalies and erroneous subtitles, and produced a full transcript of the apparently damning tape. The ‘furniture’ (headlines, pictures, graphics) on the NotW’s coverage on 2 May was, naturally, set up to paint the worst picture possible in terms of Higgins’ guilt. The “promising to cheat” graphic displayed within the story at this link and in the paper, is one example. Look what Higgins apparently said first. But study the original source material – the NotW’s own video – and pay attention to Higgins’ words and actions and not the subtitles. He does not actually say “Frame three, I am going to lose, yes, yes”. He says (20sec to 22sec): “Frame three I’m going to lose, yeah. No.” [Nodding no]. But nowhere does he demand anything. And where and when were these matches? Where does Higgins discuss any of this detail? Where is it actually agreed how he will supposedly be paid? It’s natural for a newspaper to give a story the best – most dramatic, attention-grabbing – headline and furniture. That’s normal, no problem. But as the NotW showed on 9 May, it is capable of front-page headlines that are actually untrue, not just spun. If some key details are wrong, why should a reader trust the wider picture? Back to the video: below were two screen shots, taken at 3min 22sec on the film and 3min 28 sec. The first picture (left) shows Higgins shaking hands and a table set out a certain way, the other picture a scene where four people including Higgins are toasting something with vodka (below). What is a reader / viewer supposed to believe from this? That Higgins shakes hand on this match-fix deal, and then four conspirators toast the deal with vodka? That’s how it looks. Watch the sequence. But are these two moments – six seconds apart on the NotW’s video – even from the same meeting? Sportingintelligence would suggest not. First, the camera is placed differently. Second, the table on the left holds Mooney’s ashtray and cigarettes (pink and white box) on the top right corner of the table. In the screen shot on the right, they are gone. A big box of tissues and a bottle of vodka have appeared instead. And what about Mazher Mahmood’s clothes? In the screen shot on the left, Mahmood (right) has trousers that are as dark as Higgins’s, and a dark blue shirt. In the screen shot on the right (now B&W) his trousers and shirt are both paler. This second screen shot, in the same room, was quite possibly taken from a meeting on Thursday 29 April, not the same meeting on Friday 30 April where most (all) of the rest of the footage was filmed. Does it matter, this playing with the perceptions of readers / viewers? Some will argue not. Others will argue it does. Similar arguments about the ethics of entrapment will continue. Higgins and Mooney were both “snared” in Kiev after a long entrapment process. We covered some of the details of the sting in May. A website for a fake company called Alfa Equity was integral to the start of the sting. 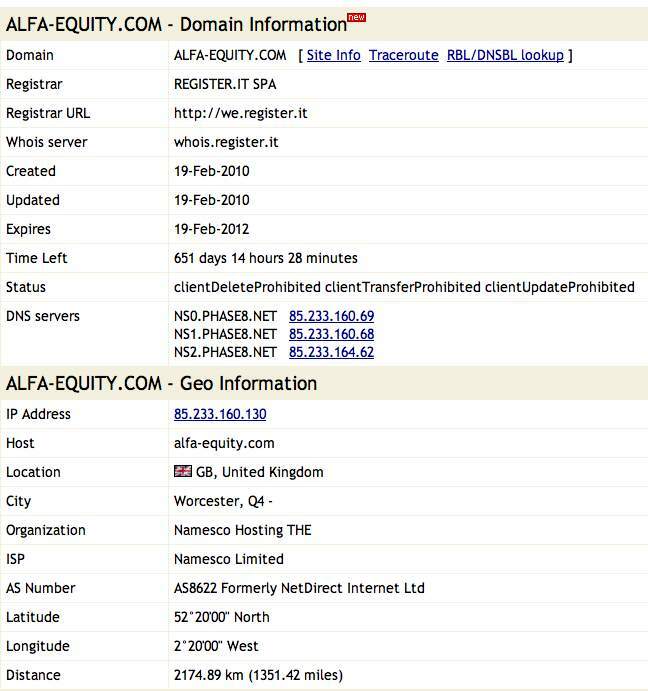 We can reveal today this Alfa Equity website was set up on 19 February 2010 and hosted by a company called Namesco Limited in Worcester (see left, and click on scan to enlarge). The website was taken down shortly after sportingintelligence began its investigation into the sting, and its cache was destroyed, although some saved scans are here. We can reveal the website’s content was copied and pasted from the site of a real investment company, Arlan, except the name Arlan was changed to Alfa on the fake website. 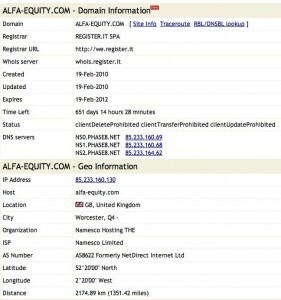 Other real companies featured on the fake Alfa website without being consulted and were unhappy their details had been fraudulently used for entrapment; sportingintelligence has agreed not to name them because they don’t want their reputations tarnished by association with a NotW sting they knew nothing about. The News of the World may be asked, at some stage, to explain why these details were used. The role of alcohol in NotW stings, especially those engineered by Mazher Mahmood, has long been a feature, most recently with the entrapment of Sarah Ferguson. Higgins and Mooney were encouraged to drink heavily in Kiev. Another person knocking back vodka both on the Thursday night and the Friday morning was another member of the News of the World’s reporting team, ‘Jaroslav’ as he was called in the NotW video, where he features mostly out of shot on the left. Sportingintelligence has obtained photographs of parts of the final days of the sting as it unfolded in Kiev, including a trip to a snooker hall. 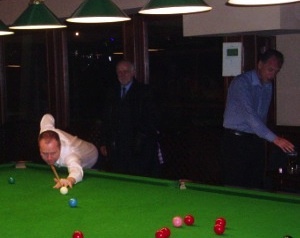 ‘Jaroslav’ is pictured here (in tie and overcoat) standing between Higgins (left, playing a shot) and Mooney (right). Sources say ‘Jaroslav’ acted and spoke like a local but it is not known if the News of the World took him to Kiev from London, or hired him locally. Snooker fans at the Kiev club took pictures, and the “Alfa Equity group” (Mahmood, ‘Jaroslav’, Higgins and Mooney) were witnessed in various locations that evening. Mahmood, in the guise of businessman Marcus D’Souzha, also encouraged a trip to a local nightspot, Mandarin. The NotW picked up the tab for Higgins and Mooney’s business trip to Kiev, including their rooms at a Kiev hotel, where at least one suite used by the NotW was rigged with hidden cameras. Sportingintelligence asked the NotW numerous questions in July and August about the accessibility of its evidence (or not) to Higgins and Mooney, as well as the role and behaviour of ‘Jaroslav’. Sportingintelligence understands Mooney and Higgins were eventually given access to NotW material only after the intervention of Ian Mill QC and the independent dispute resolution service, Sport Resolutions (UK), who will respectively judge and host the tribunal hearing. Higgins and Mooney face charges that have never actually been made public but include failing to report an approach about gambling and apparent agreement to lose frames. why did they not report what happened to the relevant authorities (ie: the head of the WPBSA) as soon as it happened? (They will possibly argue the paper was on their doorsteps within 24 hours). why did they talk about how to miss balls and lose frames? (They have already claimed they were prepared to say anything just to get out of the room). why they felt justified in entrapping Mooney and Higgins in the first place. The NotW said on 2 May that they started to look at Mooney “after being tipped off by a sports insider worried that Mooney and Higgins could be involved in match-fixing”. The credibility and motivation of this insider could be key, not to mention controversial if it turns out to be a snooker insider going to the media, not the authorities, with concerns, although the NotW will be loathe to disclose a source. what evidence they had before the entrapment began of any prior fixing, none of which has been produced, at least so far?